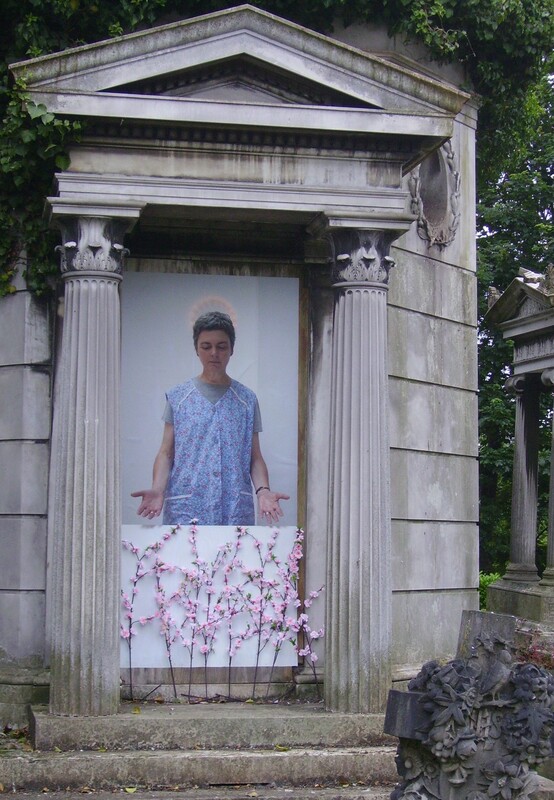 A while ago, I visited West Norwood cemetery in south London where, through July, they had an art trail of 21 pieces responding to the architecture, layout and purpose of the cemetery. It’s well worth a visit without any added art, being one of a number of large Victorian built cemeteries on the outskirts of London that are monumental in scale and intention..
For me, several of the artworks were a bit disappointing, lacking ambition considering the landscaping and visual richness of the site. The themes of remembering, celebrating and mourning lend themselves so broadly to visual interpretation, as can be seen from the many ways in which ordinary people memorialise their losses. 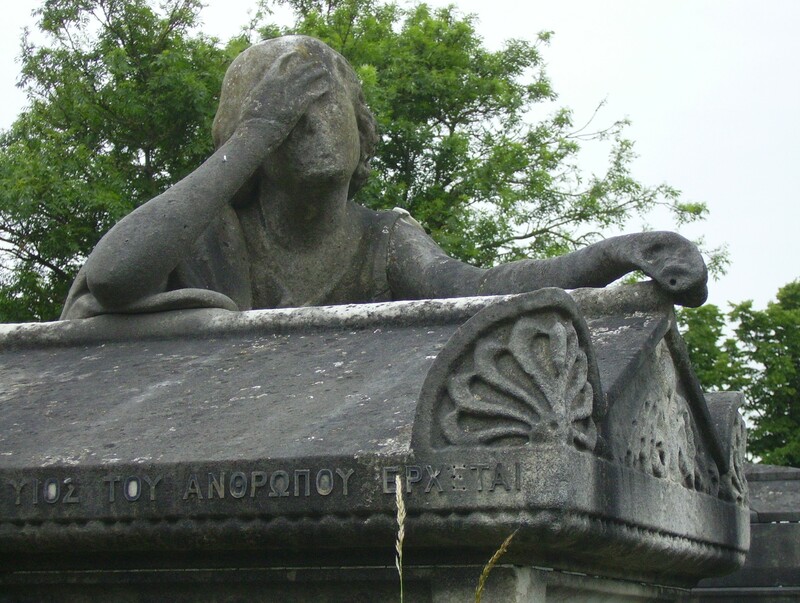 One part of the cemetery is a special section for the Greek population of London in the nineteenth century, where I was particularly impressed by this mourning figure. You can only view it from below due to the height of the stone catafalque. 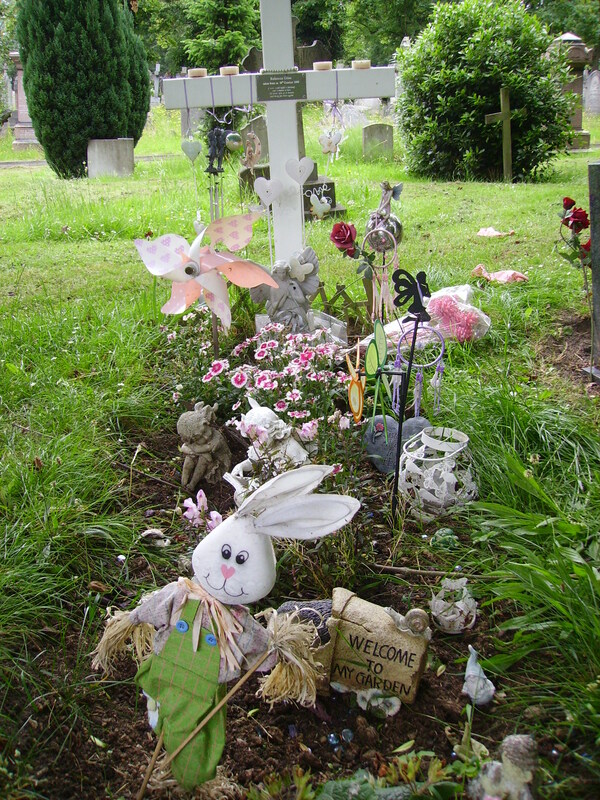 Graves for children and young people are particularly touching, but also tend to be more imaginatively decorated than those for adults. 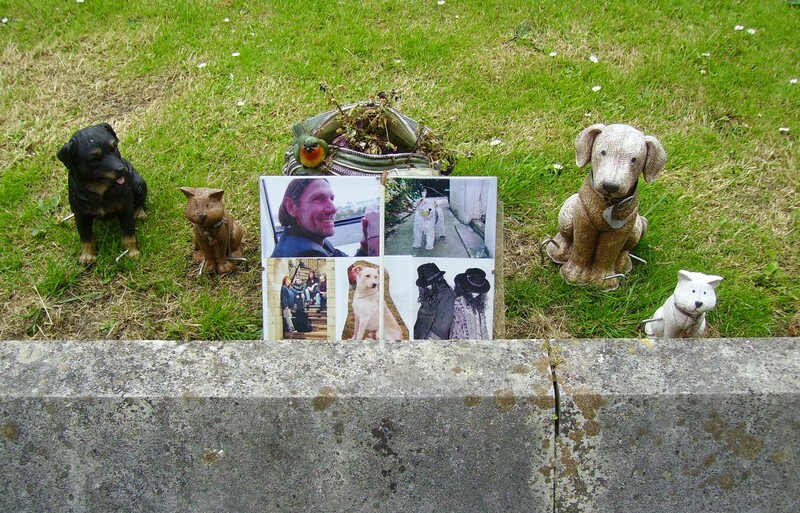 But I love this idea of passing into eternity, however one imagines it, accompanied by beloved companions. 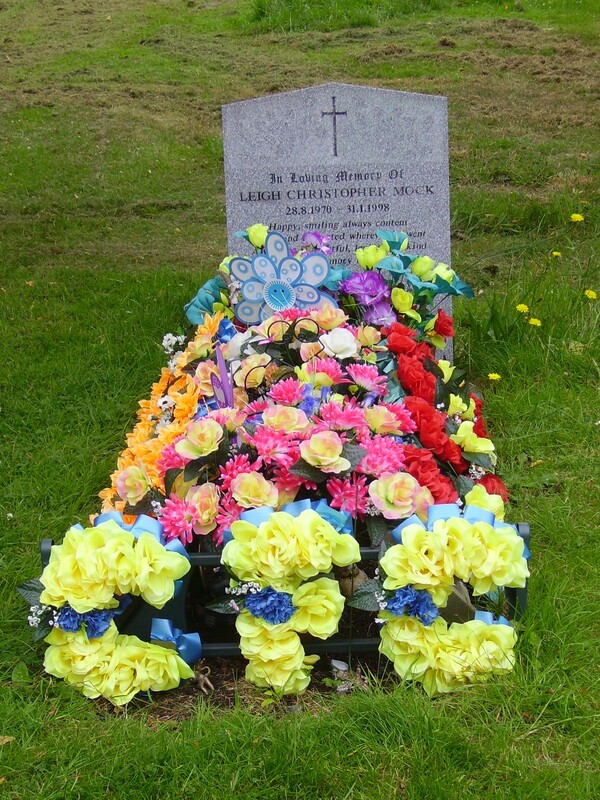 And this colourful grave is a fabulous variation on the traditional funeral flowers. 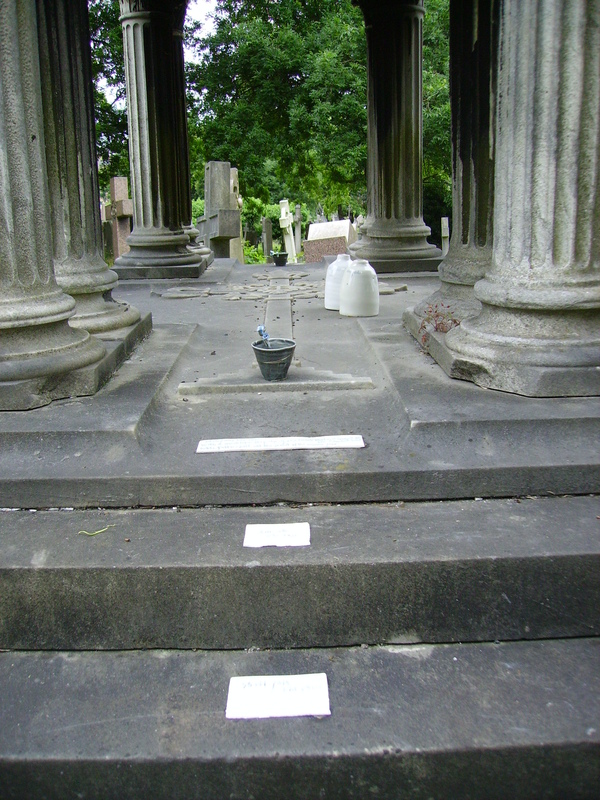 Within the structure of a standard Victorian monument, the subtlety of this next piece was almost easy to miss.The small ceramic plaques.celebrate the memory of two otherwise unremarkable people whose names the artist chose from the old registers, together with small votive objects, bottles and bowls containing symbolic materials. I wasn’t able to get the full detail of the plaques; the old fashioned handwriting from the register is reproduced in ceramic glaze. All this material links for me to the themes of memory and forgetting that I have been working with in my own projects. I have so far done a brush drawing and a watercolour painting bringing some of the imagery together, which I will record in the blog later when the series is further on. 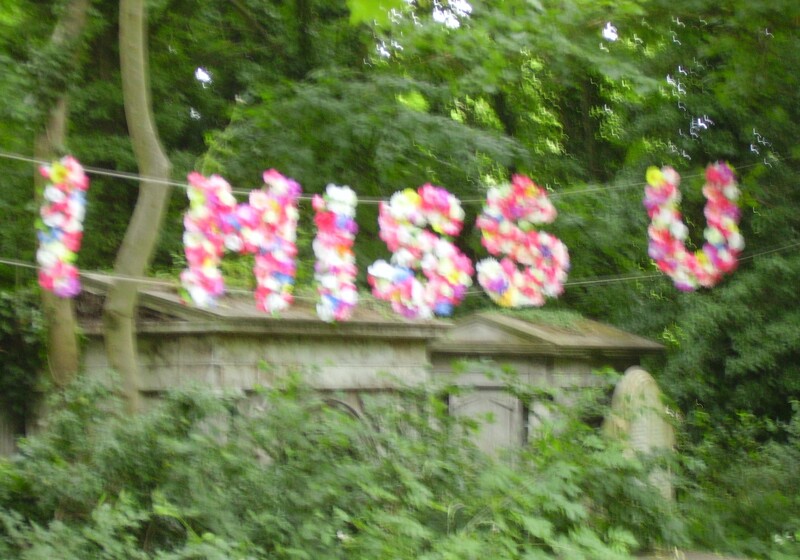 Although my photo fails to do it justice, I can’t resist adding this hanging ‘wreath’, using the now ubiquitous fashion of spelling out words in flowers. Its simple slogan perfectly expresses my own feelings about how bereavement echoes down the years.